Looking to impress your sweetheart this Valentine's Day? When money is no object, the sky's the limit, which is why we've scoured the city to bring you our list of the most luxurious staycations Hong Kong has to offer. 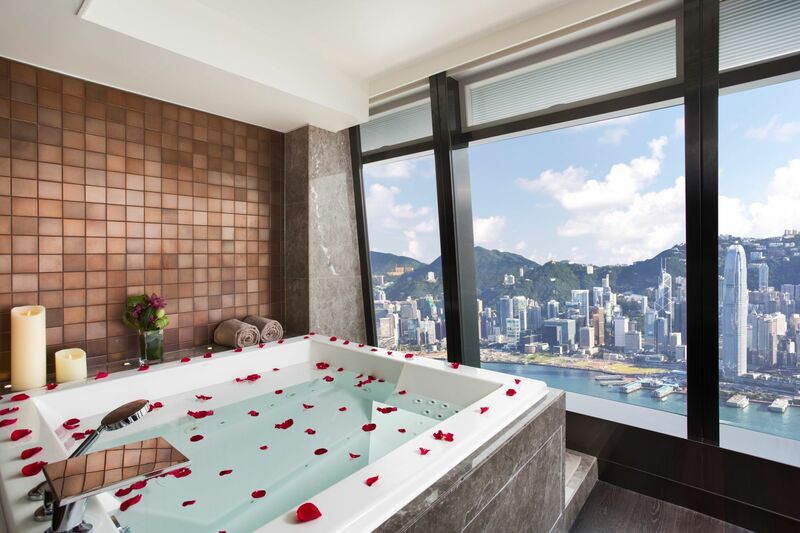 Treat your other half to a decadent staycation at Mandarin Oriental Hong Kong. Priced at HK$107,060, the one-night Valentine's Day (February 14) package includes a stay at the hotel's presidential Mandarin Suite, a Pure Indulgence couple's treatment at the Mandarin Spa, and dinner for two plus a glass of champagne at Mandarin Grill + Bar. Splurge: Extend the V-day vibes into the entire weekend with a three-night stay at the presidential Mandarin Suite (plus the above spa treatment and dinner) for HK$300,660. You'll have exclusive bragging rights when you treat your date to the "Ultimate Romance" dining experience at The Ritz-Carlton, Hong Kong. Priced at HK$18,000 per couple, you'll be the only ones in the private dining room of Ozone (aka. the world's highest bar) on Valentine's Day. There, you'll enjoy a personalised eight-course dinner menu by Ozone Chef de Cuisine Roberto Riveros, a bottle of Dom Pérignon Rosé Champagne, bouquet of 99 roses and romantic violin and guitar performance. That's not all, the package also includes a one-night stay at a Deluxe Victoria Harbour Room. Splurge: Continue celebrating the next day with an Indulgence Double couple's spa treatment. Priced at HK$5,880 for two, the 120-minute pampering session includes a 30-minute aroma jacuzzi bath with two glasses of champagne, a back massage, velvet facial and three-course set lunch for two at Tosca. Why not celebrate Valentine's Day with a bespoke dinner and staycation package at The Upper House? The evening begins with a candlelit dinner at Café Gray Deluxe, who are offering four- and five-course modern European menus featuring treats such as seared tuna, coffee-rubbed short rib and strawberry pavlova. Next, move on to "You & Me" cocktails at Café Gray Bar and spend the rest of the evening at one of The Upper House's spacious Upper Suites, complete with a romantic setup, giant bathtub and panoramic harbour views to wake up to. Splurge: Opt for in-room couple's treatments like a 90-minute aromatherapy massage or 90-minute gold polish massage to make the night even more special. The highly customisable Valentine's Day experience at The Upper House starts at HK$30,000. Stay in the heart of Hong Kong' luxury shopping and dining district with Landmark Mandarin Oriental's Valentine's Day staycation. Available from February 14-20, the Central Staycation includes a one-night stay in their L900 Landmark Suite, daily buffet breakfast at MO Bar or the hotel's other F&B venues, dining or spa credit of HK$2,000 per day, use of the heat, water, gym and pool facilities at The Oriental Spa (including a complimentary upgrade to the Sanctuary Suite upon booking a 90-minute couple's treatment), and overnight parking for one vehicle. Splurge: Bring your pet (one dog or cat) at no additional charge and/or extend your stay to enjoy savings of up to HK$1,200 per night. The Central Staycation for Valentine's Day is priced at HK$9,400 plus 10 percent. Connect in mind, body and spirit with your partner this Valentine's Day at the Four Seasons Hong Kong. Their new Art of Mindfulness package includes daily breakfast for two, a half-day spa experience with vital energy crystal healing, meditative tea ceremony and healing floral bath, plus a wellness dinner for two at three-Michelin starred restaurant, Caprice. Splurge: Zen out by booking the hotel's presidential suite for a wellness staycation like none other. The minimum two-night stay Art of Mindfulness package in the Four Seasons Hong Kong presidential suite is priced at HK$188,370 + 10 percent.